Just one week separated the Malaysia and Bahrain Grand Prix which meant that few updates were seen this weekend. However, the relentless nature of F1 ensures that even small modifications are always being brought to the cars every race weekend and Bahrain was no exception. Not so much a Bahrain-specific development as it was first seen in Australia, althoug h this weekend represented the first time that this aerodynamic modification was run during the race. In addition to the wing (or ‘tray’) sandwiched between each ‘tusk’ on the E22, Lotus installed 5 vertical vanes between the bottom of the nose and the horizontal tray. 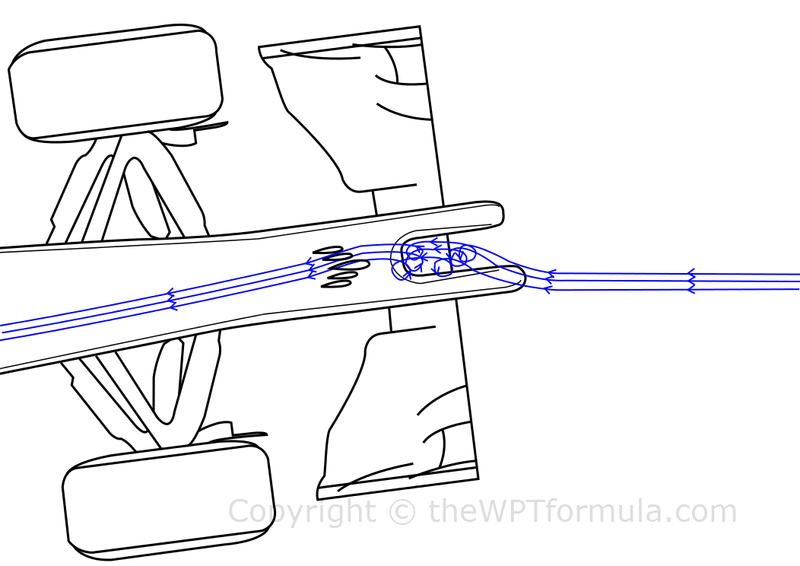 The vanes form a ‘V’ formation, with a larger element spearheading 4 equally sized smaller aerofoils. Interestingly, these vanes were always on the E22 when it featured the tray but they have only just been highlighted this weekend. The vanes must be placed on the car in conjunction with the tray to comply with Article 3.7.8. The regulations stipulate that in this area of the car (150mm forward of the front wheel centreline and within the Y250 axis), bodywork must be open in cross section. 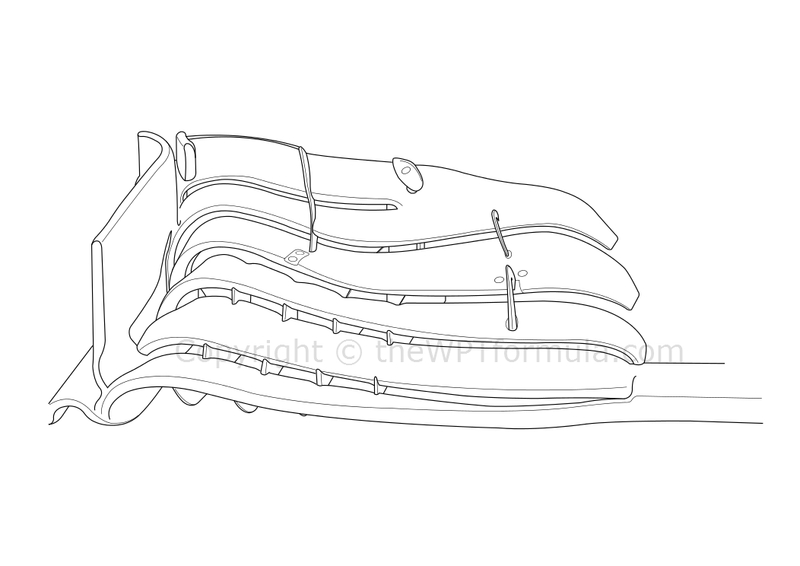 The horizontal tray alone would create a closed section to the vertical, longitudinal centreline of the car so Lotus have put the vanes in to create an open section. The regulations require an open cross section across the width of the nose, so Lotus placed multiple vanes to meet this requirememt. The purpose of these vanes is not fully recognised yet, but I’ve had a think and here’s what I’ve come up with. Please bare in mind I’m no aerodynamical wonderkid, this is just my interpretation of what’s going on! Under ideal circumstances (i.e. travelling in a straight line into laminar airflow), air passes into the gap between the two tusks and forms a small venturi. The venturi isn’t very strong because the tusks are rounded, which means that the air isn’t totally funneled through smoothly. 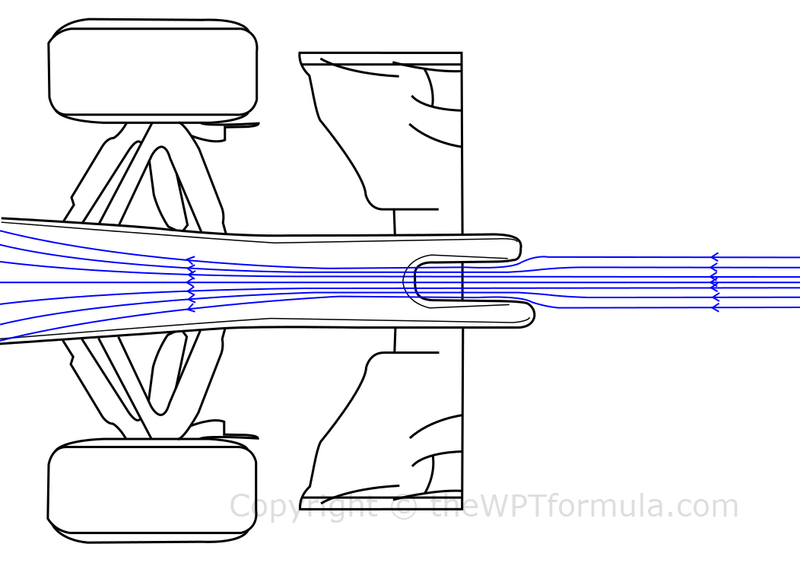 This air then flows backwards towards the splitter under the influence of the under-chassis turning vanes, causing it to splay outwards round each side of the car. An issue about the twin-tusk nose concept was discussed when the car was first launched and it involved how airflow behaves as it travelled over the tusks and into the area between them when the car is in yaw. A pressure gradient could form between one side of the tusk and the other, causing vortices to form as it passes between the two crash structures. This is where the function of the vanes come in. The above is quite a crude diagram of what I believe could be influencing the airflow as it travels downstream. Vortices roll up between the tusks, but are contained by the horizontal tray below. Airflow is then passed towards the vanes where it acts like a sieve, smoothing out the turbulent flow before its next destination further down the car. If anyone has an opinion on this please leave it in the comments below! There are rumours that even if Renault sort out their driveability and system related issues (i.e. software development), the internal combustion V6 turbo itself will still be 40+bhp down on Mercedes. To navigate around this inherent problem, Red Bull decided to remove the cascade winglets on their front wing in a bid to reduce drag. This change was done in conjunction with some minor modifications to the wing itself, effectively an evolution of the one we saw introduced in Australia. I read an interesting fact the other day that at 240km/h, F1 cars tend to produce around 1200kg of downforce. Each little vane and winglet introduced to the car aims to contribute about 2kg of net downforce. 12kg (with no drag penalty) is worth a tenth of a second per lap, so taking away the cascade winglets will have deducted some 15+kg at that speed. This won’t affect their total downforce production too much but it will go some way to increasing top speed. The front wing flaps have been revised, in particular in the inboard section which manipulates the Y250 vortex and general airflow around the front suspension where it meets the chassis. The profile of each flap has been bent over, creating a close overlapping effect rather than spaced out as they were previously. New suspension components arrived for the F14 T to try to improve front turn in. This has been more of a problem for Kimi Raikkonen who is renowned for being very particular about the general feel of the car. This trait stems mainly from his unique demands from the power steering and how the wheel weight changes throughout its motion. Lotus spent the majority of 2012 sorting out a system to Raikkonen’s liking with various iterations tested throughout the year. Having already been a Ferrari driver in the past, the team must have been well aware of his demands so this shouldn’t be a problem. Raikkonen visually struggles with the car and although the mechanical changes have helped alleviate his issues slightly, he was still locking up a lot and generally man-handling his F14 T. This was particularly evident in Turn 9 where the drivers are on the brakes and turning in slightly before meeting the apex. This entry was posted in 2014 Highlights, Technical Highlights and tagged 2014, bahrain, bull, developments, e22, ferrari, front, gp, highlights, lotus, nose, rb10, red, tech, technical, wing on April 8, 2014 by thewptformula. Interesting piece. I read that Webber predicted Red Bull could win in Monaco. Whilst Mercedes seems streets ahead, Ricciardo was one of the few (only?) to reach 8th gear in a recent race, suggesting the Red Bulls got short gear ratios. Reckon they stand a chance? The Lotus looks a real dog at the moment. If they could sort reliability, do you think (as it stands) they’d have a realistic chance of points? Right now they seem to be well off the pace, and they can’t just blame Renault because Red Bull and Toro Rosso have been doing a lot better. Monaco is about confidence in the driveability of the car so, personally, I’d question that statement from Webber. In my opinion gearing isn’t such a big deal this year! The torque band is so big that shorter ratios don’t really equate to better acceleration, as even short shifting to reduce wheelspin isn’t really working. Williams have very short ratios and I’m sure they know what they’re doing. Time will tell. I’m not really sure what Lotus’s real problems are but it’s predominantly power unit issues. Lotus develop their own software alongside Renault, whereas Red Bull and STR will have very similar software as they’re sister teams, who also work closer with Renault. They are having to focus so much on this aspect of the car rather than general setup over a race weekend and it’s costing them dearly. Fundamentally I really do believe the E22 is a good car, it’s just extracting the best from it that will be difficult. I think Monaco will be interesting. As you say, gears don’t appear to have been a huge issue this year, but if they show up anywhere I’d guess it’d be in Monaco. It’s a shame to see Lotus struggling so badly. You write that with the Lotus nose, only one of the vertical vanes would be needed for legality – I dont think this is correct. If you imagine a plane like you have drawn, forming a slice of the nose, it must form one open section no matter where that plane is positioned laterally. If there was only 1 vane, then if the section was moved to the region between the outside of the single vane and the inside of the tusk, you would get multiple sections. Of course! How could I have even thought that… Thanks very much, it shall be amended. I’m glad that you frequently visit my blog, thanks for the comment!